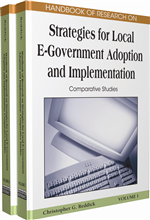 The chapter is based on the results of an international survey of municipal Web portals conducted through a collaboration between the E-Governance Institute at Rutgers-Newark, USA, and the Global E-Policy E-Government Institute at Sungkyunkwan University in Seoul, South Korea. The joint study ranked municipalities worldwide based on their scores in 5 e-governance categories of security and privacy, usability, content, services, and citizen participation. Crucial trends in the development of the municipal Web portal indicate a growing digital divide between cities belonging to the OECD and non-OECD nations and to explain this divide, the relation between e-government service delivery, and quality of life across the globe is examined. Studies on user satisfaction, well-being, and the quality of life under e-government are important so as to understand the societal impact of the use of information and communication technology in public service delivery. Much of this research on the performance of e-government has focused primarily on the public agency, with less consideration of the societal impact of providing services online. Traditional methods of measuring government service, both online and offline have focused on the public official or administrative tool as the central element. Behn’s “three big questions of public management” consider the public bureaucrat as the framework of measurement and improvement, thus ignoring the social consequences of public administration in a democratic society (Kirlin, 1996). In this context, an important consequence of the growing use of computers is the growing digital divide among nations and also within nations both developed and developing. Digital divide is not just a divide that applies to people but it can be applicable on a larger sale to countries. Some countries are ranked higher while some are ranked lower on the scale measuring the degree of digital divide. Digital Divide: Digital divide is defined as the divide between those who have access to internet and those who do not have such access among individuals or geographical regions. E-Government: E-Government is defined as the phenomenon of providing government services online, available 24 hours a day, 7 days a week. E-Governance: E-Governance is defined as that stage of e-government that inculcates digital democracy, online citizen participation, and online public discussion along with the aspects of online public service delivery. Municipal Webportal: The official web portal on which the city provides information regarding its administration, online services, city council, mayor, and executive branch. Performance Measurement: Performance measurement is defined as the procedure of examining the status of a process or practice and using the statistical data to examine its progress toward specific objectives. Usability: Usability is defined as the extent to which a website user finds the website easy to navigate and the extent to which user can use the information on the website to meet a specific objective. E-Democracy: E-Democracy is defined as the phenomenon of usage of internet to enhance the democratic process by encouraging online civic engagement, online citizen participation, online discussion, blogs etc.